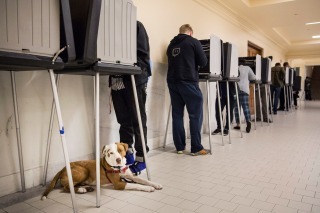 SAN FRANCISCO, CA - JUNE 07: A dog lays on the ground while its owner votes in the California primary on June 7, 2016 at City Hall in San Francisco, California. Starting Friday, the minimum wage in San Francisco will increase from $12.25 to $13 an hour as part of a series of increases that will see the city's hourly wages climb to $15 by 2018, according to city officials. Mayor Ed Lee celebrated the increase, which comes ahead of the Fourth of July weekend, this morning during a new conference at his office. Calling the today's increase a milestone, Lee said the pay hike would help working families who are struggling in San Francisco. "We know that with our workforce, there's still an affordability gap. A lot of people are working two jobs to support their families. So we must celebrate these moments where we can get together to help them," Lee said. The increase is the second in a set of increases that will see the city's minimum wage rise to $15 by 2018. In May 2015, the city's wage increased from $11.05 to $12.25. "It's an honor to serve the city that supports some of the most aggressive and strongest labor protections in the U.S.," the city's Office of Labor Standards Enforcement Director Pat Mulligan said. "It's also particularly fitting that we're celebrating this announcement of an increase in minimum wage throughout San Francisco as we lead into the Fourth of July Independence Day weekend because for many workers, a modest increase or any increase in their earnings or wage earnings represents a very real and well defined independence of its own," Mulligan said. Carly Liu, a part-time In-Home Support Services domestic caregiver, said in a statement, "I am so happy the minimum wage is going up, so now low-wage workers can buy a little more food for dinner without worrying too much. Although the increase is not huge, it helps improve our quality of life in San Francisco." Also today, the city of Sunnyvale will see a minimum wage increase as well. The wage will increase from $10.30 to $11, according to city officials. The pay hike will also continue for Sunnyvale residents, until the minimum wage reaches $15, on Jan. 1, 2018, city officials said. Voters in San Francisco and Oakland overwhelmingly approved pay hikes during the Nov. 2014 elections. In San Francisco, proposition J won with 78 percent of the vote and in Oakland, Measure FF won with 82 percent. The two initiatives were each originally filed by a coalition of Service Employees International Union members, community-based organizations and other labor unions. At the beginning of the year, Oakland's minimum wage was raised from $12.25 to $12.55. Other Bay Area cities that have also taken measures to raise their hourly minimum wages to $15 by 2018 include Emeryville, Mountain View and Palo Alto. Earlier this year, Lee and Lt. Gov. Gavin Newsom joined a labor group in submitting voter signatures to the city's Department of Elections for The Fair Wage Act of 2016, a ballot initiative that would have raised the state's minimum wage to $11 in 2017 and with a dollar increase every year until it reaches $15 in 2021. However, in March, Governor Jerry Brown signed a new agreement that will raise the state's minimum wage to $15 for most employees in 2022 and for all employees in 2023. The state's minimum wage hit $10 per hour on Jan. 1. Under the new plan, it will rise to $10.50 next year for businesses with 26 or more employees and continue rising gradually until it reaches $15 per hour on Jan. 1, 2022.